AMU Application Form 2016 is available via Online and Offline both modes. Interested candidates either apply online or download application form from the official website and fill the form. The application forms has been shown in the official website of Aligarh Muslim University. Candidates have filled the AMU Application Form with correct and complete information. AMU Application Form is common for all the programs. Get here application forms details, dates and how to apply for AMU 2016. Candidates are required to fill separate Aligarh Muslim University Application Forms for each course of study as detailed in this Guide. The filling of AMU application forms starts from February 2016. However, candidates should submit a single Application Form for courses for which a combined Test is to be conducted. AMU Application Forms shall not be transferred from one course of study to another under any circumstance. If a candidate submits more than one Application Form for a course of study, ALL such Application Forms of the candidate may be summarily rejected. Candidate should clearly specify his/her order of preference of Course / Branch / Main Subject / Stream / Specialization from among those listed under the course of study concerned. The order of preference indicated in the AMU Application Form 2016 will not be changed. For courses where the application Form is to be filled OFFLINE, the candidates have to download the Application Form and then fill it manually. Fill the form correctly after analysis all instructions. Applicants can directly pay the registration fee to business office of AMU and are suggested to secure hard print of application form as well. The application fee will be Rs.500/- for all programs which candidates have to pay. All candidates has to sent in there AMUEEE Application form along with necessary documents to the following address. Put your thumb impression, signature and paste your recent photographs at the designated place on the Application Form. Attach the appropriate Demand Draft along with other relevant document(s) with the Application Form and do not fold or multilate it in any way. While applying for various courses of study, the candidate is advised to consult the schedule of Admission/Departmental Test which appears under each course of study, wherever applicable, so as to ensure that there is no clash in the Test schedule of various courses for which the candidate is applying for admission. The University assumes no responsibility if the candidate has opted for more than one course of study for which the Tests have been scheduled simultaneously. No request for change in address for correspondence as specified in the Application Form shall be entertained. Candidate must attach the original Demand Draft with his / her Application Form and also write his/her name, date of birth, course of study and Transaction ID (if available) on the reverse of the Demand Draft. Self attested copy (both sides) of High School / Secondary School Certificate (SSC Examination) in support of date of birth. Self attested copy (both sides) of Marksheets / Gradesheets of qualifying examination. In case the result of the qualifying examination has not been declared at the time of applying, candidate must submit self attested photocopies of marksheets / grade sheets of examination passed in the preceding year. Self attested copy (both sides) of Marksheets / Gradesheets of all other examinations passed / appeared (including parts therein) after passing High School till date. Self attested copy of documents in support of claim of Internal Status and / or special categories, if any. Self attested copy (both sides) of qualifying GATE examination, if any (applicable only for applicants to M.Tech. courses). Received after the last date. and no correspondence shall be entertained in this regard. 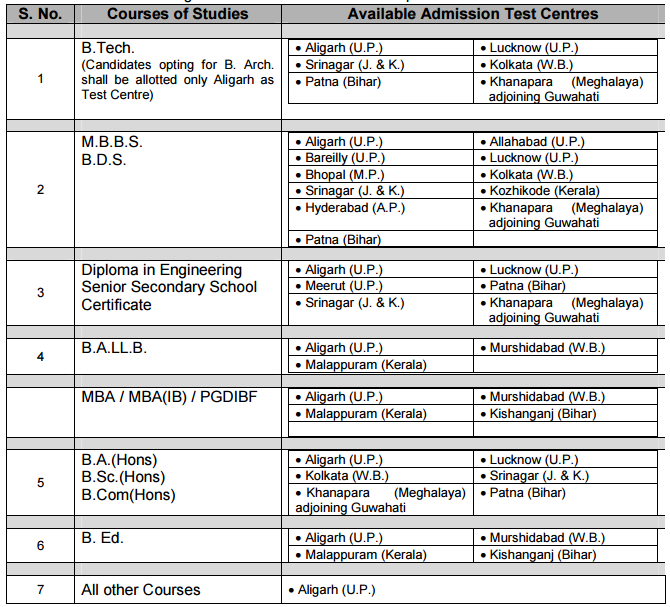 A list of cities where Admission Test for various courses of studies is to be held is given below. Candidates are required to indicate in the column provided in Application Form their preference of Admission Test Centres against the available Test Centre options for various courses.